Kind of fancy for a Wednesday! Leave a Comment on Kind of fancy for a Wednesday! ​I am almost done transferring my content from the other blog! First of all, no I will not be posting daily through your 2017! It just seems lately that I’m in the mood. So what’s for dinner? Glad you asked! 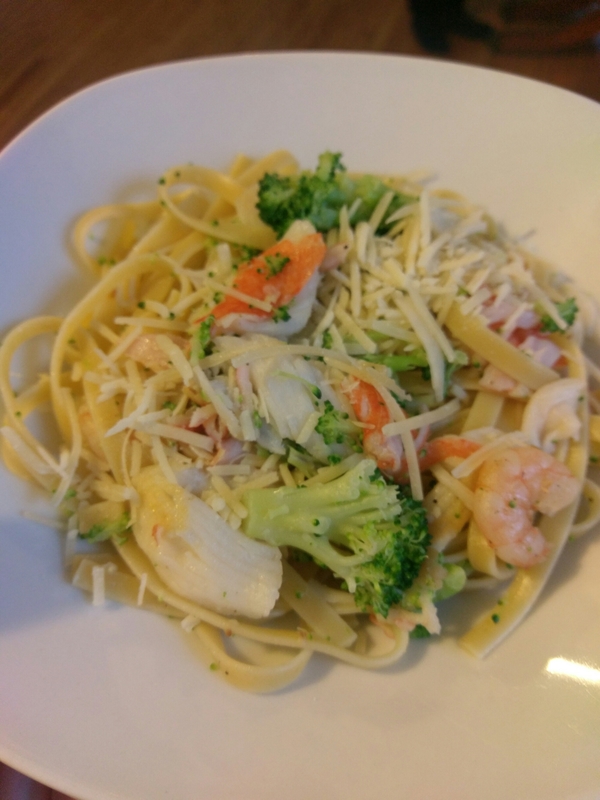 Tonight is a family favorite, a simple seafood pasta. It looks beautiful and is super tasty 😋. Perfect for a night with kids or as a filling passing dish! In a frying pan add butter, garlic, crab and shrimp (tails removed) and heat through but don’t cook too long or shrimp will become tough and the butter won’t coat the pasta properly, set aside. In a large sauce pan cook fettuccine and add the broccoli for the last couple minutes of cooking to get a good blanch on them. Drain and return to the pot. Stir in crab mixture sat and pepper. Plate up and top with Parmesan cheese! I usually serve this with garlic bread. Delish, Enjoy! !